For the Love of Jewels...: Jeweler, Metalsmith, Goldsmith, Silversmith? What are we? Jeweler, Metalsmith, Goldsmith, Silversmith? What are we? Unless you have been living under a rock, you are probably aware of the Orchid network for jewelry professional and hobbyists. 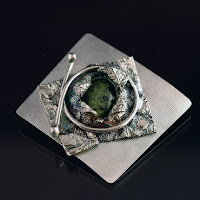 This online forum is one of the most valuable sources of information for me as a jewelry designer thirsty for knowledge from those with more experience. Recently a fascinating thread has been circulating that someone started by asking a simple question. What do people who make and/or sell jewelry call themselves? You might think we'd know this seemingly simple answer but it sparked a debate that is going on several days now. The consensus seems to be that we are JEWELERS...and that a person is a JEWELER is they sell jewelry, even if they don't know much about making it. However that doesn't make a person necessarily a BENCH JEWELER who must apparently know how to do repairs as well as make jewelry. And, a person can be a GOLDSMITH even if they never work with gold. A goldsmith, we learned, is any person who makes small objects of precious metals, usually for personal adornment. It was also said that a GOLDSMITH must see the big picture; creating from initial conception through completion. Some call themselves METALSMITHS, however, one person mentioned that she has been contacted to make wrought iron and shoe horses...not exactly the same thing! Given that I rarely work with gold, I hardly feel that "goldsmith" works for me, though it sure sounds nice! I previously thought a better term for me was either "metalsmith" or "silversmith" but I learned that neither of those are right at all! So, I have decided I am a JEWELER. I like the ring to that as well, although as a "jeweler" I have so much still to learn from far more accomplished jewelers. At one of my classes, I noticed a man wearing an apron that said "Jeweler In Training". Maybe that's me! Thank YOU for your tweet! I found you at Craft for health and read your wonderful article. I love your jewelry! It is absolutely gorgeous! 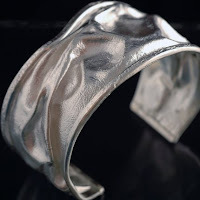 I think we are jewelry artists, because creating handmade jewelry is an art form. It's just small works of art that are worn on the body, for all who see it to enjoy. Hey great work! and thanks for describing about Jeweler, Metal smith, Goldsmith. Now I get the right meaning of it. As I am just starting out, I am a Jeweller in training. Great blog. What a great debate! IMHO I'm not sure that everyone who makes jewelry is a 'Jeweler'. 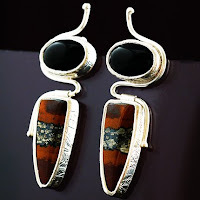 There are a lot of us who make jewelry from polymer clay, beads, wire, etc. and don't know the first thing about Silversmithing or Goldsmithing, which I typically picture when I hear the title 'Jeweler'. Jewelry Artists or Jewelry Designers might be a better title for us. For you guys that do the Silver and Goldsmithing, the title is perfect! Love your gorgeous work btw! Just found you on Twitter today and I am very impressed with your jewelry! Wow amazing. What a beautiful designs. I love these design. I really like your collection. I wish to wear this jewelry. I would like to appreciate your efforts. Thanks a lot for sharing such a nice collection. Fabulous! It is simple but elegant to wear. I love to wear it. Linda Gebert: Abstracts and Color!